Lancashire ensured their defence of the T20 title ended with a bang and not a whimper as they produced a sensational bowling performance to beat Birmingham – helping to eliminate the Bears in the process. 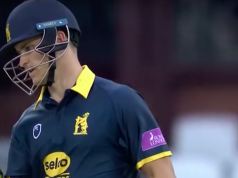 The Lightning entered the game knowing they had a slim chance of progressing to the quarterfinals, but Durham’s victory over Derbyshire meant that the win was not enough to send the reigning champions through. Birmingham were the side in possession of that fourth qualifying spot and knew that victory at Old Trafford would seal a fourth successive quarter final. But a magnificent bowling and fielding display by Lancashire – who defended their total of 124 with the spirit of champions, comprehensively outplayed them. Unfortunately for Lancashire, that title-winning form came too late, with shambolic form early in the T20 Blast ultimately costing them a spot in the knockout phase. The game proved to be one of those low-scoring thrillers, with Lancashire’s 125 looking within reach of the Bears’ for much of the innings before the squeeze came on from Lancashire’s bowling unit. Birmingham eventually reached just 94-8 from their 20 overs as both sides were eliminated from the competition. It was the second-highest attendance of the season at Old Trafford, but for a while in Lancashire’s innings the 10,263 spectators might have been wishing they had made alternative plans. To say it was hard going is an understatement. On a slow, low wicket Lancashire’s batsmen struggled to get going. Just 29 runs came from the powerplay, and that featured the wickets off both Tom Smith and Karl Brown for single-figure scores. The grind continued and just 20 runs came from the next five overs, as Liam Livingstone and Steven Croft both came and went for 10 and two respectively. The Lightning were 49-4 with nine overs remaining. Alviro Petersen had looked the only bright spark, making a patient 27 from 33 balls, so when he also departed to the spin of Josh Poysden, Lancashire looked to be in real trouble. In truth, they were rescued by a magnificent sixth-wicket partnership between young Tom Moores and Jordan Clark. Moores, on loan from Nottinghamshire, struck the first boundary for 10.2 overs in the 14th as the hosts looked to get the scoreboard moving. The pair reached a 50 partnership from just 34 balls, including two fours and a six from Clark off Rikki Clarke. By the end of the innings they had put on 65, Moores making 39 from 32 balls and Clark 31 from 18 – dragging Lancashire to a respectable total of 124. Early in the Bears reply, it was an even contest, with the powerplay overs yielding 33 runs for the loss of two wickets – as Bell was caught behind by Saqib Mahmood and William Porterfield was run out. The young Lancashire seamer rounded off the powerplay with the rare commodity in T20 cricket of a maiden. Lancashire had assessed conditions well with the bat and were doing so with the ball. The Bears had reached 60-2 by the end of the 11th over, needing 65 from 54 balls to reach the quarterfinal. Spin was to be the crucial factor in the chase, as Lancashire’s four spinners bowled 14 overs for 64 runs – including four wickets. The part-time spin of Liam Livingstone dismissed the Bears’ mainstay Sam Hain for 28 and the wickets continued to tumble. After Matthew Wade was bowled by Lancs skipper Croft, Arron Lilley removed Laurie Evans and Rikki Clarke in consecutive balls – with superb catches from both Smith and Livingstone. At 80-6, needing 45 from 24 balls, Birmingham were struggling badly and there was no lower-order sparkle to rescue them. Mahmood returned to grab two wickets and finish with excellent figures of 3-12 from his four overs. The victory was sealed by a margin of 30 runs. Lancashire had showed the class of champions, but it was all too little too late. The unlikely possibility of a no result between Durham and Derbyshire didn’t happen, as victory for the Jets eliminated the reigning champions. It also meant that Birmingham were out, with just one win in their last six games condemning Dougie Brown’s side to group-stage elimination. Lancashire captain Croft expressed his disappointment at the failure to qualify and blamed the attitude of the side early in the campaign. “It’s definitely frustrating. We’ve turned it on in the last two games which has made it a very frustrating end,” Croft said. “I think we maybe dined out on T20 champions quite a bit and didn’t really work as hard as we needed to to win games of cricket. “We were slow getting out the blocks in the first few games. There were games that were in our hands. We proved that we’ve got the talent and we were probably sleeping a bit those first few games.